We get a lot of questions on our electric wiring articles from folks tackling electrical projects in their own home. One of the most common and intimidating parts of electrical work is dealing with the main breaker panel. This article provides an overview of a breaker panel. If you’re tackling an electrical project, we highly recommend a professional resource that can show you all the details of your project, like this home electric wiring book by Stanley that we use all the time. While electrical work isn’t always complicated, it can be dangerous. Some jurisdictions require you to be an electrician to perform any electrical work, even in your own home. Almost all jurisdictions require you to get a permit to complete any substantial electric work beyond simple tasks like replacing receptacles. Never perform a task that you aren’t qualified to perform, and always take appropriate precautions. Before we get started on the panel, note that virtually all homes in the United States are wired with 100-200 amps @ 220 volt service. For homes equipped with natural gas, propane, or oil heat, 150 amps @ 220 volts is usually enough to meet electric demands throughout the year. For homes with an all-electric heat system, 200 amps is the minimum recommended service level. In houses with a heated pool or spa, electric radiant floor heat, etc., 250 amps or more is recommended. 220 volt service is provided by two service entrance lines, each of which carries 110 volts to ground. The service lines are out of phase with each other, hence how you can get 220 volts of total potential across the two wires. These two service wires come into the panel along with a ground wire (usually the ground is a bunch of strands that surround the hot wires). 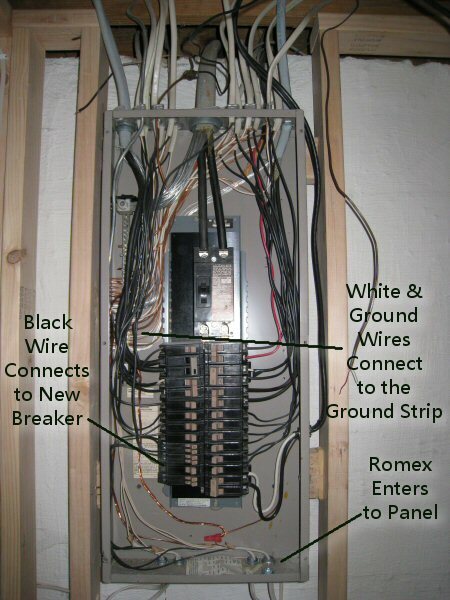 The service lines connect to a main breaker that controls the whole house and ensures the whole house doesn’t overdraw current from the transformer. From the main breaker, each of the two service lines connects to one of the power buses on the back of a breaker panel. In the picture below, you can see the two major service lines coming in from the top of the panel. You might think that the left half of the panel is powered by one of the feeds, and the right half by another, but this is incorrect. Going down vertically on each side of the panel, the service line that power the slot alternates. Remember, panels are generally numbered with the odd numbers down the left and the even numbers down the right. This means that breakers 1 and 3 are powered by different source lines, while breakers 1 and 5 are powered by the same line. This is by design, and important. You’ll notice that there are some ‘double-size’ breakers in most panels. These breakers are 220 volts breakers that usually power big appliances (like an electric stove or furnace). Since they sit across both lines, they can provide 220 volts of potential to an appliance. Don’t confuse the double-size breakers with smaller tandem breakers, which can control more than one circuit but can only provide 110 volts of service because they are only connected to one service entrance line. The ground wire(s) that enter the house with the hot service entry lines connect to the ground bus in the panel. In the picture above, the bare aluminum ground wires tie into the ground bus on the upper left. Also connected to this ground bus are the ground (bare) wire from all circuits going out from the panel (both 110v and 220v), and the neutral wire from 110v runs only. In most cases, house wiring is copper. You can see in the picture a bunch of copper (bare, ground) and white (common, neutral) wires connected to the bus. 220 Volt Circuit Breakers – These breakers usually power electric furnaces, dryers, heat pumps, and water heaters. 220 volt breakers each take up 2 slots in the panel. If you are providing power to an appliance that only uses 220 volts (and not a combination of 220 and 110 volts), then you’ll run 2-wire Romex in the appropriate gauge to that appliance. The black and white wires will be connected to the top and bottom of the breaker, and the ground wire will be connected to the ground bus. (Note that 2-wire Romex actually has 3 wires, 2 current carrying wires–black and white–and a bare ground wire). In this configuration, most electricians will wrap the white wire with black electrical tape. This makes it easy to see that this particular white wire is actually hot and should not be treated like a neutral wire. If an appliance is going to use 220 Volts and 110 Volts, 3-wire Romex is required. Remember, 3-wire Romex actually has 4 wires – a black, red, white, and bare. In this setup, the black and red wires go to the breaker, and the white and bare wires go to the ground bus. 110 Volt Circuit Breakers – These breakers are more common and each takes up one slot in the panel. These always require 2-wire Romex of the appropriate wire gauge for the number of amps that will be run on the circuit. In this configuration, the black wire connects to the breaker, and the white and bare wires connect to the ground bus. What Gauge Wire is Appropriate? How to Run a New Circuit from a Main Breaker Panel. Free 2008 National Electric Code (NEC) online. Great post! Around here new homes are all built with a minimum of 200 amp and then we tack on 100 amps at a time depending on use. I have recently installed a pond and have a lot of 110 v pumps, lights, etc… Can I run a 12 gauge wire 20 amp breaker out of my 220 v main panel. Reason for that is due to it being easier to get to. is a 110 window unit and a small hot water heater to much to run together on a 220 plug? I am installing two ovens, a 220v oven with convection and a 110v microwave with convection in a space where there used to be a combination two oven setup, regular 220v oven and 110v microwave on the same four wire circuit, black, red, white and bare ground. The 110v microwave plugged into the top of the 220v oven using a normal 110 volt plug. For the new setup I need to figure out which combination, red/white or black/white will give me 110v which I can feed into a separate 110v receptacle for the 110v plug. That will work but its possible that the breaker will not trip properly if the microwave fails. I am building a new home. I t has a total square foot living area of 6,000 sf. The first level is a slab. The second two floors will be wood with hardwood. I want to use an electric radiant heat system using mats. This will be the sole source of heat. I live in southern New England so late October to early May there would be significant usage. Average price per kwh is $.073. I would use mats with a 240 v usage. I will also have a washer and dryer, range, double ovens, and all the other things a traditional house has that uses electricity. My contractor has advised that such a system will require 400, 600 and possibly an 800 amp service. Furthermore he has advised that the total cost to install will exceed $100,000. I have quoted materials and the materials will cost between $28,000 to $38,000 depending upon the manufacturer. Everything I have read indicated that installation is very easy and inexpensive compared to a hydronic radiant heat system. Nothing tells me about the amp service requirement. Q: For a 6,000 sf house is electric radiant heat viable? Q: based upon what I have stated what is the required amp service? Is there an extensive cost to that service? Vincent, for a 6000 sf. house, electric radiant heat probably isn’t the right solution. What’s motivating you to go that route as opposed to another radiant solution – potentially something that is plumbing based? Figure most radiant systems run 15 watts / sf. That would make your solution 90,000 watts if the whole thing were “lit up” – think walking in after the house hasn’t been on for a while on a cold night and you turn on the whole house. 90,000 watts = 90kw … at 240 volts that’s 375 amps. Add 20% for room on the breakers and you’re talking 450 amps just to run the heat! Electric systems also suffer from other problems, like they can burn out in sections if they are too over insulated. You have to be careful piling clothes under a bed, for instance, because if the heat can’t escape, the wires can fuse. This isn’t common, but its a consideration. No such problem exists with a plumbing solution, the heat will just escape somewhere else along the pipe. Hope this helps … I would listen to your contractor. If you want electric radiant, put it only where it makes the most sense .. bathrooms and kitchen, maybe a mud room or two. If I were able to plan a house from the start, I’d put radiant tubing in the foundation so the basement were warm, but I wouldn’t put in electric. that’s a last resort option if the slab is already in place. We are remodeling the kitchen in our 15 year old home with 200 amp service. We currently have a gas stove and cooktop and are adding a Bosch single convection wall oven. The literature states that the oven has a maximum connected load of 240/15.8amps/3650watts. The builder installed a spare 30amp breaker with 10/2 wiring (white/black/copper) adjacent which was for a steam sauna that we never installed. Do we need to rewire from the breaker with a 3-wire or 4-wire and is 10/3 appropriate? I am installing a wall oven that requires 220v 20amp. I have 10-2 red black white coming in to a junction box where an old oven was located and is wired to the main panel with a 220 30amp breaker. I have 10-2 black white copper to run from the new wall oven site to this junction box. Can I tie black to black, white to red, and copper to white(for ground) at the junction box and run it to the new wall oven? Also, do I need to change the outside breaker to 20amp 220. The wiring on the wall oven is 12 gauge. David – No, you can’t. The range must have a dedicated circuit. Sorry for asking about an old-ish post. We used to have a Magic Chef high/low microwave/range unit. When the microwave died and I slid the unit out, the only electrical connection was the 3 wire 220 plug. The microwave was powered by 2 wire (1 hot, 1 neutral, no ground) coming from the range’s power connection block (I think). Isn’t this similar to what David Heier wants to do? Or is there something special about the all-in-one high/low unit? Thanks! Alan, if there’s only a 3-prong plug on a 220 circuit, there’s no neutral wire, only 2 hot wires (at 110 volts each, out of phase, and a ground wire). Ground and neutral should only be tied together in the main breaker panel. Most microwaves I’ve seen run off of 110 volts (usually on a 20 amp breaker, even though they draw 15 amps of power). You would have to tie your neutral to the ground, which is a no-no. There are some strange code exceptions for doing that sort of thing with legacy wiring specifically dealing with ranges, but you just don’t see it in newer homes. My suggestion is to go to the library and look through the latest National Electric Code (NEC 2008 I believe is latest). Look up the sections on ovens and ranges and you should be able to find the guides for what is allowed. im looking for a fuse.its a 110 and its in a see through plastic casing with the plugs on the bottom of it. can any one help me? I’m building a new house in Ghana and I want to wire the house with both 110 and 220 volts outlets. The voltage in Ghana is 220volts. Can you give me an idea of how to do the wiring. I have already got a Panel. Do I need a transformer? Your will be greatly appreciated. Winfred, sorry buddy, this one is out of our league, since we don’t know what the electrical system looks like in Ghana. It really depends on whether you have two out-of-phase 110volt leads, or one 220volt lead. I just can’t be sure. Is it possible to have a “partial” power outtage in my home? I think one of the 110v mains was somehow off for a while today. Certain runs through the house were off and others were on. All 220v appliances, two ranges on different circuits and the A/C compressor were off. I have a 200 AMP MAIN PANEL that was installed about six years ago. I reset the main breaker and all of the service breakers but that did not seem to help. While I was trouble shooting, I turned on my Bosch range and “click” the power came on for all of the lines that were “off”. None of the breakers had tripped. The transformer is on the pole out back and my service lines are clear from there to the house. They were run when the 200 AMP upgrade was done. I don’t know if I did something to fix it, or if the power company was doing something that corrected the situation. I did not see any lineman or trucks in the neighborhood. Mike, I’m just seeing this. Apologies for the incredible delay in responding. I have never heard of anything like this, but I know it is possible for one pole to go out. I would assume the problem was at the transformer though. Will my 220 volt tanning bed work in the home that I am moving to has a 200 amperage system? Thank you!! 200 amp service ought to be more than enough for a tanning bed, but you will need to have a 220 volt circuit installed for the tanning bed. Best of luck. What black and white wires are you testing? The ones that enter the mobile home, or at some outlet downstream? Or in the box? I recently bought my wife a Wolfe System tanning bed for mothers day, and I don’t have a 50 amp circuit available in my breaker box. Is it possible to tie into and existing 50 amp wire underneath my home to power the plug for the tanning bed? If not……..can it be tied in at the breaker box? Any response is welcome, cause at this time my wife is getting pretty anxious to try out her new gift!!! Whoa buddy! You need to contact a licensed electrician for this one… You need to make sure you’ve got enough space on the current pipe for the extra load, and for a 50amp 220v circuit, you really need to get professional installation unless you 100% know what you’re doing. I have a 50 amp circuit box on the exterior of my home that was once used for a generator, but it isn’t being used any longer. Can I use this circuit? I have simply ran out of space in my breaker box to add another 50 amp breaker. I have existing wiring running under the house capable of handling the load. Just want to know if a junction box can be used for the connection? If it’s a generator circuit, wouldn’t it be feeding a transfer switch or something like that? Are you simply asking if you can re-purpose the wire? Our tenant purchased an electric dryer instead of a gas dryer which our outlet was set up for in his apartment, which is in a permitted addition attached to our house.. He is a journeyman electritian and asked if he could tie into our 220 air conditioning unit located next to the washer and dryer hookups. We said no because we only have our licensed electrician work on our electrical and didn’t want a 220 dryer anyway. Despite our contract forbidding him from making alterations, repairs or improvements without written permission, he decided to take two 110 extention cords from inside the apt through a door and window & connect them to dryer somehow. He said his electrician buddy told him how to do it, it was safe and all that would happen was a breaker would trip. Was this dangerous? This sounds unsafe to me. I would require the tenant to pay a masts electrician to put in the circuit (with permits pulled) or just get a gas version of the dryer. The lights on the electric range are probably powered off of only one 110 volt leg. I’ve had some weird things happening. a few days ago my dryer overheated and when turned on, would not get hot. I stopped using it. 3 day’s later the outside main tripped itself. I cut it back on and it happened again, so cut it back on. 5 minutes later my oven broiler was blaring red hot while the stove indicated it was OFF. I unplugged it. Now today it tripped 2x again so I flipped all the 220 breakers off. Later I flipped the breaker for the water heater and within 10 minutes the outside main off again?? Discouraged, I went to take my cold shower but the water was very hot only after 10 minutes. What is going on with all my 220 volt? and why does only the outside box trip and not inside individual breakers? Stumped please help! thank you! Dawn, not sure but you definitely need to get an electrician. Sounds like something is seriously wrong with either the wiring coming into the house or a ground fault or arc somewhere. I would get some professional advice ASAP. I’ve ran into this problem several times recently. Why does a a dryer or range that is supposed to have 220 across the incoming legs have 110 on both sides to neutral but not 220 when tested together. I came across one today where the range and dryer in the house were both like this. I have an outbuilding with two underground 120’s coming off a single 60 amp breaker in the main building. One of the 120’s went out. The multi-meter is showing zero volts to ground on one of the leads (right side of the load center). The breaker at the main building is showing hot on both lines, so there must be a break in the line. Its going to take me a while to run a new entrance 2 ought down there. In the mean time is there any reason why I can’t consolidate some of the critical branch circuits onto the other side? I’ve checked amperage on some breakers at full load and they’re very low with flourescents – plenty of room to pull some of the leads from the right side to the left. I realize the breakers could trip with two much running on the outlets, but most of the branch circuits are overbuilt with 10 gauge and low amp breakers. great website….I’m wiring a tool shed for 110v from a 220 panel and zoned out, So I logged on to find where to tap the white wire and your article gave me that info.THANKS! My landlord just installed a new breaker box in my home. Everything worked fine until it got cold and had to turn the heating system on. (The weather was hot when installed) When you turn on the heat it runs on auto then when it shuts off the breaker goes off, and the heater does not come back on until you go out and flip the switch. What can be causing this to happen. It’s getting cold! I was doing some simple electrical work today so had the circuit breakers shut off. After I was done I noticed my dryer (240v) wasn’t working, so I stuck a voltmeter in the outlet and it came up zero. I have flipped the circuit off/on a few time without luck. Is there something I am missing? Is there another fuse somewhere I may have fried? I have 100 amp service and my furnace runs 2. 60 amp breaker what should be in panel box ? in case the window is the wrong size. Replacement windows are available in such a wide array that most older window styles can easily be matched. hope for its past customers and will for future generations. The power has gone out in my house. There were no tripped breakers, however #9 breaker which on the inside panel cover reads furnace has a red line showing througha plastic window. Does this mean the breaker has blown? If so why would the entire house lose power? Any insight would be appreciated. In most jurisdiction does a 110 receptacle be beside a 220 receptacle 8 inches apart with the gas line being 2 inches from the 110 receptacle on the horizontal plane. I run a small mobile home park and the power coming into my main from the service reads 119 and the other 109, is this the power companies problem or what? Please let me know! DOES IT MATTER WHERE A NEW DOUBLE CIRCUIT BREAKER IS PUT IN THE PANEL. I HEARD NEAR THE TOP?? Hey I was wondering if it was possible to use two 220 outlets on 1, 10-3 line? My question is I want to hook a timer up to my breaker box so it will turn on and off my Christmas lights. I bought a 220v timer will this work or do I need a 110v timer. We have a 220 ac unit in the window now. But they are expensive to replace. Can the 220 plug be safely converted into 110, by an electrician, and will doing so affect the consumption of electricity? A friend, whos an engineer but not an electrician, told me thet of we do have that done that the split circuit will draw twice as much power even though we are only running a new 110 ac until. Makes no sence to me so i would like to find out before we proceed. I just have a quick question and didnt know were to post it. Can a 10/2 wire be connected to a 60 amp breaker? question, currently have a power box 220 V going to the heat pump, also had a in wall heater installed , Electician tapped into the 220 V box. I have decided to install a mini heat pume for the room addition, the AC man looked at the box and said I would have to replace the box with a additional circuit breaker ( 15-20 amp ) why? as the wall heater is 220 V works fine, just expensive to run, plus he wants $800.00 to install the small mini heat pump, split system…ripped off? Transformer . Question is : how do I tell the 220 line from the 110 line coming out of the ground where there was once all my equipment . It’s all under ground from the side of my home to the ponds edge . I do have a junction box just outside my house foundation , then on to the pond. RE: line run underground to above ground pool- about 10 years ago electrician ran electric underground from main circuit panel in garage about 100 feet to pool (for filter) how do i know if he connected 2 110 cables or not? asking because i’m thinking of getting a heat pump for the pool which requires 220…when i look at circuit panel i only see a single switch indicating 110….but maybe there are 2 110 wires coming in and only one is connected because that is all that was needed for the filter?? Great Article. post – I Appreciate the insight . Does anyone know if my business could find a sample Indiana Out of Hospital – Do not Resuscitate Declaration – DNR – Statutory Form version to fill out ? I added a new circuit and breaker to my panel. Since even though the main breaker is off, the main supply wires are still “hot” from the street, I covered the terminal block with electrical tape so that I would not accidentally come in contact with it (example as I was feeding in the new romex wires). Can I leave the tape there or is that some sort of hazard? I’m thinking heat or something. I’m renting a shipping container with built in lighting and 110 recepticals and a window unit AC. Each on their own 20a breaker as far as the inside box goes, the outside is set up like a house’s main in where it’s got two hot poles to a tandem 60a breaker. Since this is a very temporary structure can I just use a 10g extension chord for each pole to connect it since no 220 amp anything is actually happening in the unit? If appliances that are running on 220 and 220 leg of power breaks or goes out, can this damage those appliances? I live in mobile home park. Box and meter are across the street. I don’t think I’m responsible as I pay a lot lease. Management company or other homeowner effected by this problem paid the electrician. It took management company and electric company more than a week to repair. This was n August and it was 96 degrees in my house, my oven went out and water heater. Nightmare. P.s. the management company had been told by an electrician that entire box, wires and 2 meters on this box needed replacing a very long time ago. 8m 65 and disabled and know nothing about power except the box inside my house. trouble shooting 220 volts everthing that runs off 220 is not working tested with a meter showing it to have 120 on on both legs but when I turn on somethige like the stove the lights come on but will not heat up?